After emerging from the waterhole and walking past our Jeep, Prince (as he is popularly known as) walked along the path leading to the dam. After following the path to the dam site for a few yards, something caught the attention of the Tiger and he veered to the right and disappeared into the Lantana. All of us assumed that he will emerge at the clearing before the dam site and we all headed there. 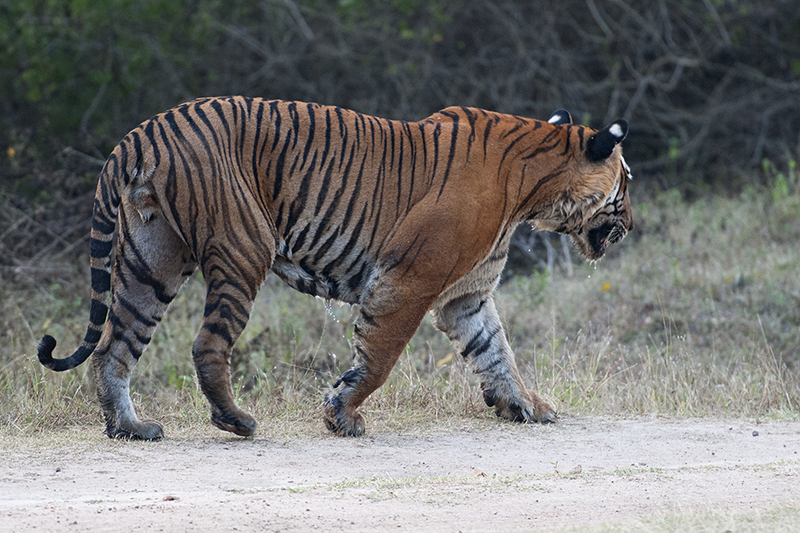 But after waiting for about ten minutes, we got a bit restless, thinking that maybe we had missed the opportunity of seeing this massive Royal Bengal Tiger walk along the fringes of the dam in Bandipur National Park. I had this feeling that we should retrace our path back to where we saw the Tiger disappear into the Lantana. As our Jeep made the final turn onto the straight stretch of road towards where we had seen him last, we saw him sitting right in the middle of the road. Turning around and retracing our path was a huge chance that we had taken and it had paid off handsomely. 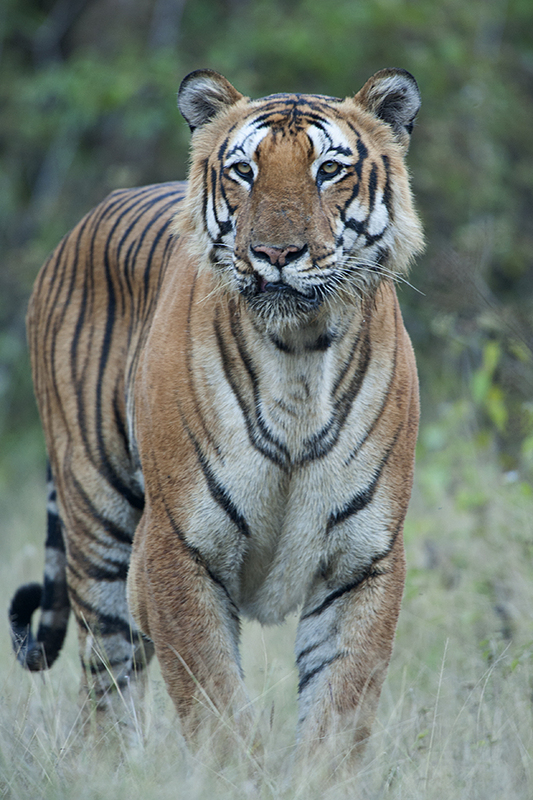 We switched off the vehicle and I got down to the floor of the Jeep in an attempt to get some eye level compositions of this Majestic Prince of Bandipur. 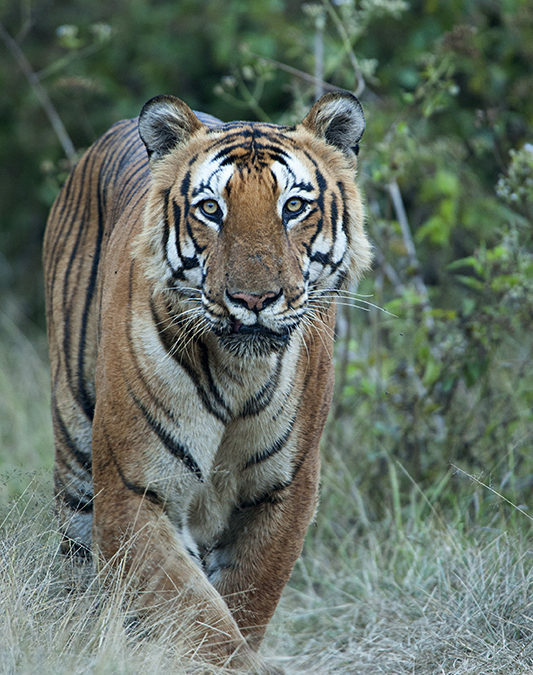 Seeing a Tiger at this proximity took the breath away from all the guests in our vehicle while our cameras clicked away to glory. 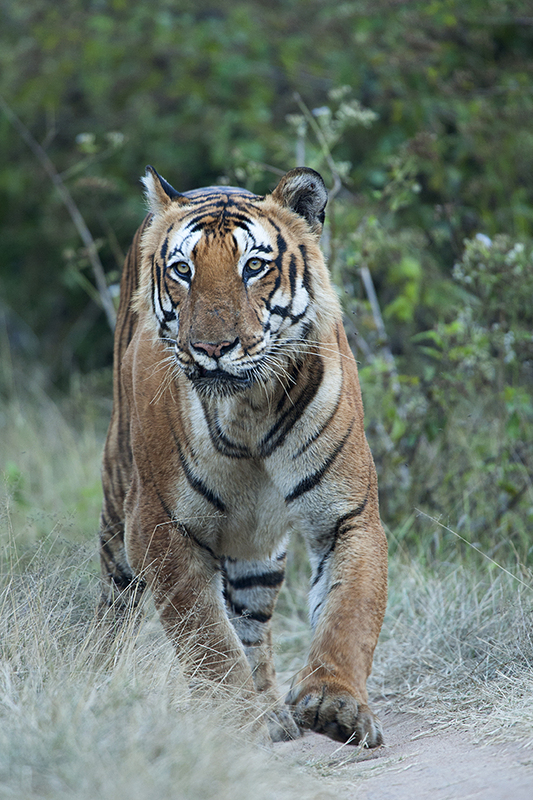 Soon the news of this Tiger road block spread like wild fire and all vehicles came rushing to where we were. 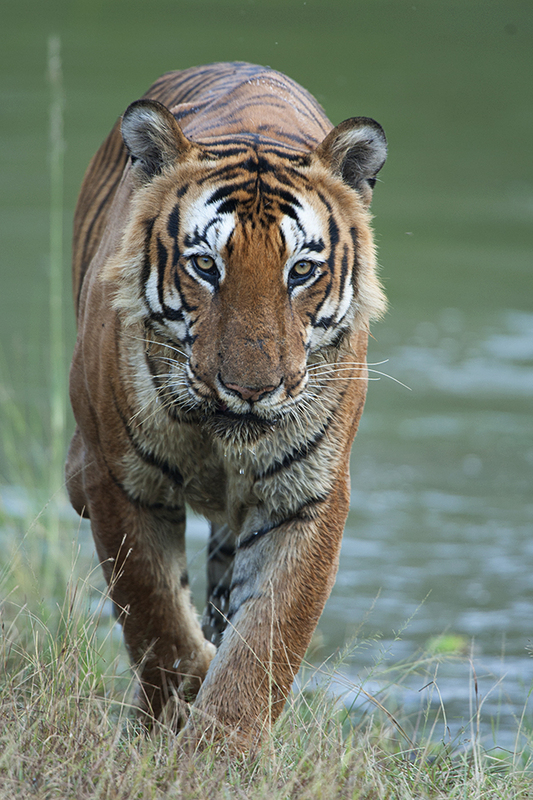 Some vehicles went around and came from the waterhole side of the route, which was from behind the Tiger. Hearing the vehicles approaching from the other side, Prince got up and walked towards us. He came close to the Jeep and stood for a few seconds before walking past us really close (I could have almost reached out and touched him). He then crossed the tracks once again through the maze of vehicles and headed off towards the thick lantana cover ahead. 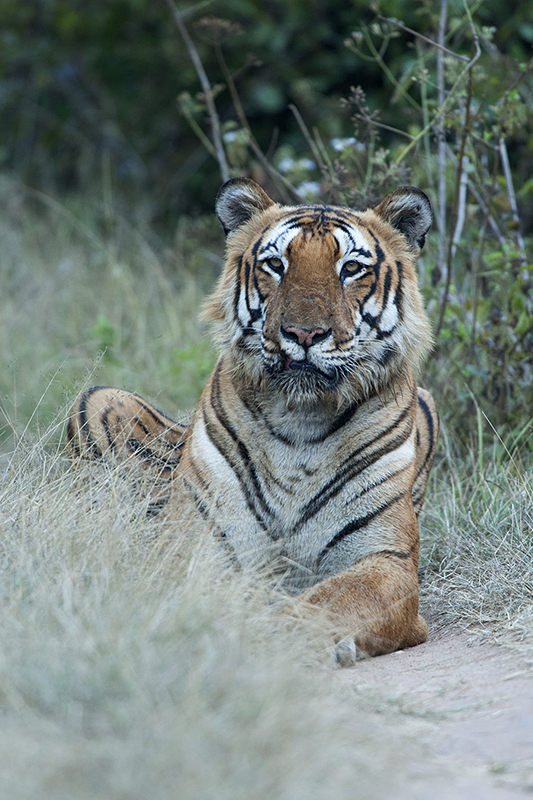 This was a spectacular sighting of the most popular Tiger of Bandipur – affectionately called the Prince of Bandipur. Given the conditions in which we saw him the last time, many did not give him a chance of surviving the summer. And yet here he was still surviving against all odds and giving all of us such spectacular sightings time and again. HE IS WONDERFUL GENTLEMAN OF BANDIPUR ,JUSTLIKE MACHLI IN RANTAMBORE HE IS ENTERTAINING ALL THE WILDLIFE LOVERS BY HIS PRESENCE. I HAVE SIGHTED HIM TWICE, BUT TOO FAR FROM MY BUS, BUT THIS IS WONDERFUL HATS OF TO PHOTOGRAPHY..